Take a two-wheeled tour at these great cycling events. With over 900 kilometers of Great Lakes shoreline, rolling farmlands, lovely port side towns and villages, there are a lot of scenic roads in Ontario’s Southwest that provide a picturesque back drop for road cycling trips. Last August, the region played host to the Great Waterfront Trail Adventure, where riders from all over spent a week riding the new 640km Lake Erie Waterfront Trail. The event may have occurred last year, but the best part is the signed road cycling trail remains for all to enjoy at any time; all along the north shore of Lake Erie. Not only is it a great road trail, but it also takes you through beautiful port towns and parts of both Essex Pelee Island Coast and South Coast wine regions. To go along with the Lake Erie Waterfront Trail, there are a number of great road cycling events happening over the course of the summer across Ontario’s Southwest. First up on the schedule is the Tour de Caledonia ride on June 14th. 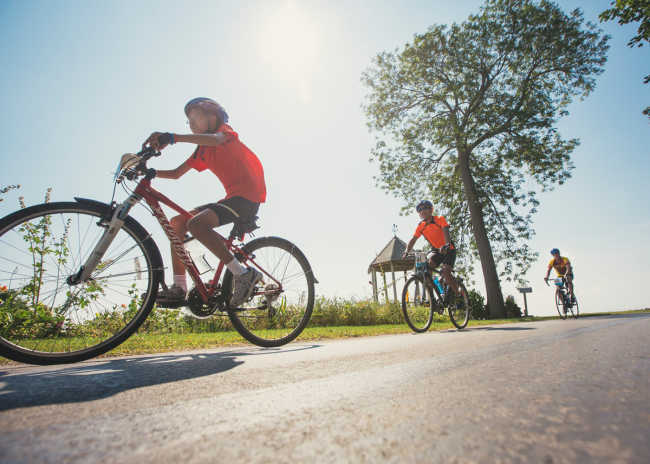 This event offers two route choices for riders through scenic Haldimand County; the regular route which is 20-30km on the Rail Trail or the advanced route of 98km for experienced distance riders. Next up on the calendar is Le Tour de Norfolk taking place July 19th-20th. This go at your own pace recreational tour is open to all ages and offers four different ride lengths ranging from 40km all the way up to 160km. You’ll explore the quaint towns and villages of Norfolk County, have an opportunity to see and learn about the crops growing in the fields, and ride the twisting, quiet back roads of the county known as Ontario’s Garden. As we pedal on, we make our way to the popular 3 Port Cycling Tour in Elgin County on Aug 16th. Elgin County is well known for its ports and this tour gives you a chance to ride between three of them in one day with the full three port 160km ride through valleys and along the Lake Erie coast. If you’d like to try a shorter distance, there’s also a 100km route that’ll take you through half the county, and a 50km route that will take you to the quant former fishing village Port Bruce. 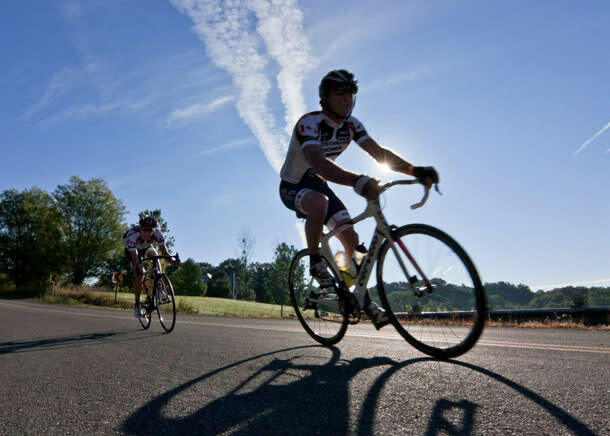 When September rolls in, there’s not one, but two more road cycling events, each in a different part of the region. On September 6th is the Southwest Challenge Cycling Tour that will take your through London and the countryside of Middlesex & Oxford counties. The 60km route takes on the quiet roads between London and the Strathroy- Carodoc region of Middlesex County, while the epic 180km ride will take you through the best roads the region has to offer in London, Middlesex, and Oxford. There’s also an intermediate 110km route that offers the highlights of the 180km route. Finally, on September 27th, is the Canada South Coast Bike Tour in Essex County. Participate in a 15km, 32km or 70km ride on portions of the 48km long Greenway Trail or tour the region and visit some of the Conservation Areas on the 58km or 110km road routes. As you can see, whether you prefer long routes or just short casual rides, if you want to get out on the open road on your bicycle with a group of like-minded individuals, Ontario’s Southwest has an event to fit your needs. No matter where you choose to hit the road in the region, the one thing you can be sure of is that you’ll be surrounded by the natural beauty and scenic landscapes that shape the region.